Recently, I was looking to upgrade my Home Theater PC in the living room so I could play games a little faster using Steam Big Picture. Looking around on eBay, prices for quad core CPUs were surprisingly high for my old Core 2 motherboard. Then I ran across this little sticker that lets you use LGA771 Xeon processors on an LGA775 motherboard. I'll admit: at first I was skeptical. But then I did some searching around on tech forums, and found that apparently this mod is actually legit. So, I went ahead and bought one of the stickers along with a $50 Xeon E5450 (which is virtually identical to an LGA775 Q9650 which runs for about $150 -- and roughly equivalent in speed to an older-generation Intel i5 CPU). Once I got my sticker & CPU, I followed the instructions here, applying the sticker to the processor and chopping two plastic tabs out of the socket on the motherboard. Then I installed my new processor and fired up my PC. Nothing but a black screen. Crap. So, I searched around, and found that the newest BIOS version of my DP35DP motherboard struggles with quad core processors. That led me to downgrade the BIOS. Unfortunately, to do this, you have to remove a jumper to put the motherboard into recovery BIOS flashing mode -- and for whatever reason, it took several tries before the PC would boot off my USB drive to do this. Once I got the BIOS downgraded, I put everything back together, put the BIOS jumper back, and fired up the computer and HOLY-CRAP-IT'S-ON-FIRE! Apparently I'm not good at stuff. 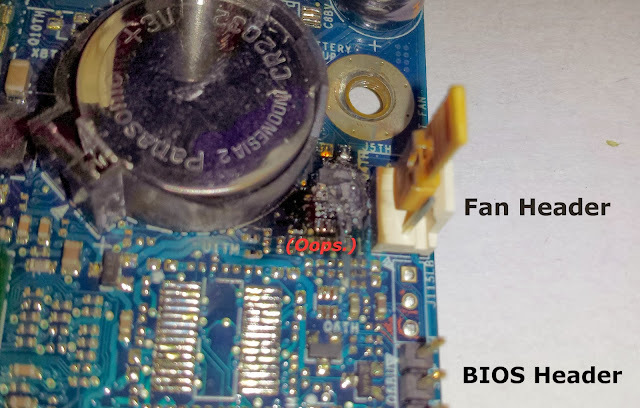 It turns out that the BIOS jumper being right next to the fan power header did not play in my favor. So, another $50 to buy an Intel DP43TF motherboard, and it worked. I win! A $150 upgrade for $50 $100. P.S... It turned out that my old Intel DP35DP motherboard was incompatible with this mod; so I'd have ended up replacing the motherboard anyways. I kept telling myself that as I threw away the old motherboard. Do you have a source for the DP43TF board? I'm searching everywhere and cannot find one, unfortunately. I need to give my video/file backend a few more years of life and having the E5450 processor already, this would be the ideal scenario. I got mine from eBay user ITRecycleNow, which is apparently an alternative storefront for UnixSurplus.com. Unfortunately, they don't seem to sell them anymore. Yeah, I contacted them and nada. So, it looks like I'm going with the DP45SG board and different RAM. That board should make things all OK on my end. Thanks for the help!